MOUNTAIN VIEW, CA--(Marketwired - Jan 9, 2015) - HealthLoop, the Silicon Valley digital health darling that automates follow-up care between doctors, patients and care-givers between visits with clinical information, announced today that Chief Executive Officer (CEO) Todd Johnson will be interviewed live on iHeart Radio's debut episode of HealthTech Talk Live hosted by Ben Chodor and broadcasted nationwide on iHeart Radio/ Clear Channel Atlanta Studios - 640 WGST AM this Saturday at 3:30pm ET. In this exclusive double-segment interview, Mr. Johnson will talk about the innovations occurring in digital health as a result of shifting incentives in the healthcare delivery system. Learn about the next wave of digital health platforms for patients, physicians and healthcare insurers. Take an in depth look into the CEO behind the company's success. Learn about the company's technology and how it is transforming healthcare delivery and rethinking the ways that patients experience healthcare. Shareholders, analysts, industry professionals and all interested parties are encouraged to listen live via Clear Channel's nationally syndicated iHeart Radio stream. HealthLoop is a cloud-based platform that automates follow-up care; keeping doctors, patients and care-givers connected between visits with clinical information that is insightful, actionable, and engaging. Our peer-reviewed follow-up plans automate the routine aspects of care while tracking patient progress and monitoring clinical areas of concern. Our analytics engine sifts through and filters the deluge of patient-generated data in real-time; focusing the care team's time and attention on patients who need them the most. For more information please visit www.HealthLoop.com. Todd is a serial healthcare information technology entrepreneur committed to building a great product, team and company. Todd has a proven track record of cultivating great ideas into great businesses while striving to build great company cultures and brands. Prior to joining HealthLoop, Todd was the founder and CEO of Salar, Inc. -- a Baltimore, MD based provider of acute care physician charge capture and documentation solutions. Working with the nation's leading medical centers and physicians, Salar grew profitably year after year before being sold in 2011. If you're interested in being a guest on HealthTech Talk Live radio show, please contact 1-800-PublicRelations at support@1800pr.com "ATTN: Health Tech Talk Guest Inquiry." 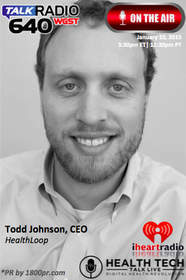 Chief Executive Officer (CEO) Todd Johnson of HealthLoop will be interviewed live on iHeart Radio’s debut episode of HealthTech Talk Live hosted by Ben Chodor and broadcasted nationwide on iHeart Radio/ Clear Channel Atlanta Studios – 640 WGST AM this Saturday at 3:30pm ET. Public Relations and Marketing by 1800PublicRelations.